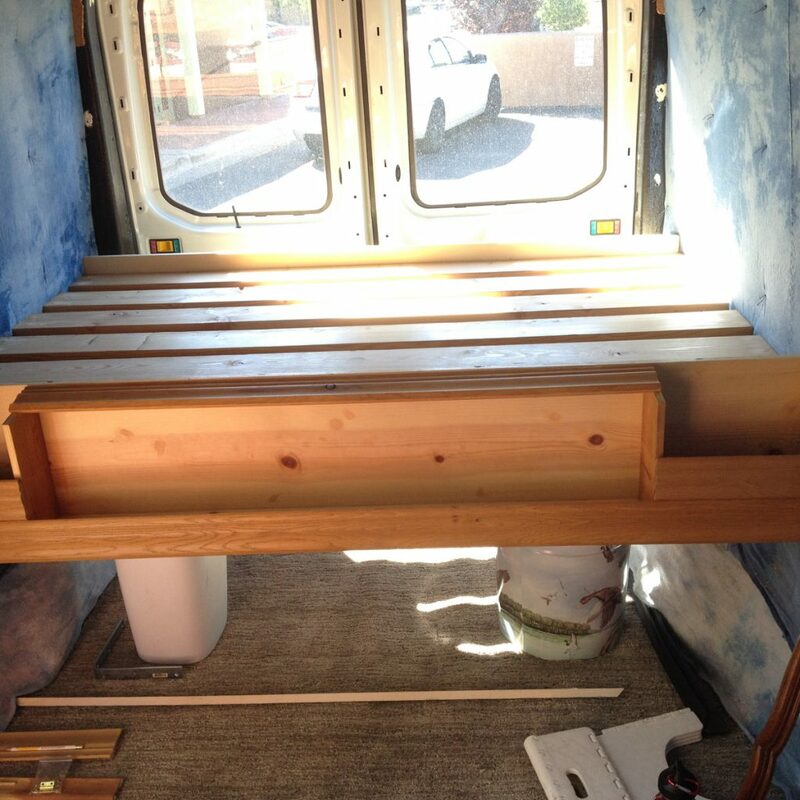 The bed frame came next, and since the bookshelf and nightstand unit will be attached to it as part of the frame, they got built at this point, too. 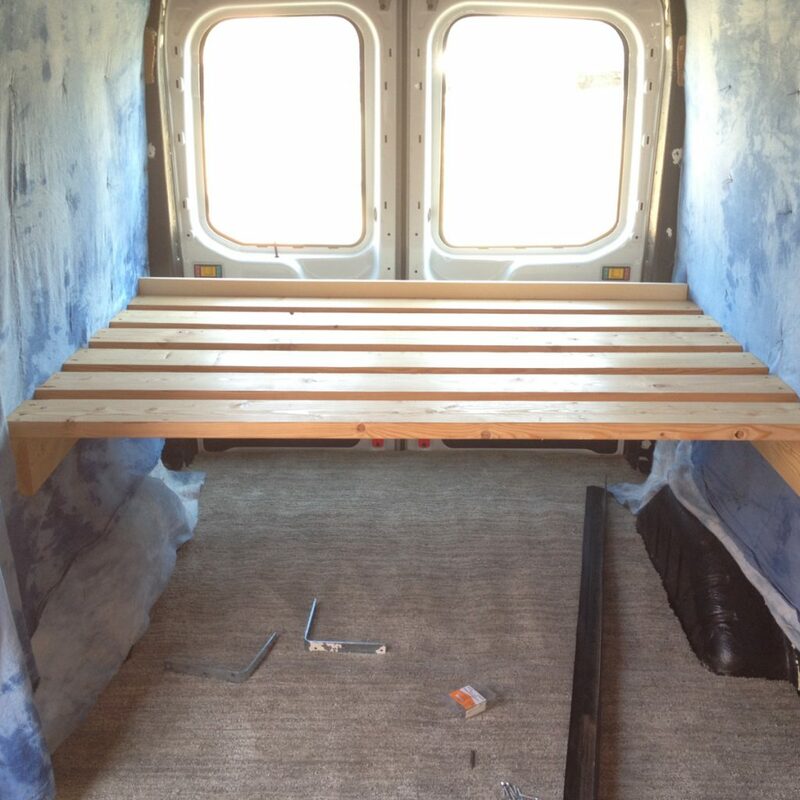 The bed placement and orientation is perhaps the single most critical item in the interior, as it will determine in large part where other fixed items will go. 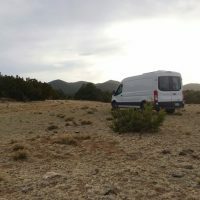 I considered several different options, most notably either lengthwise along one wall of the van or even widthwise right behind the cab seats. I even toyed with the idea of a raised bed. 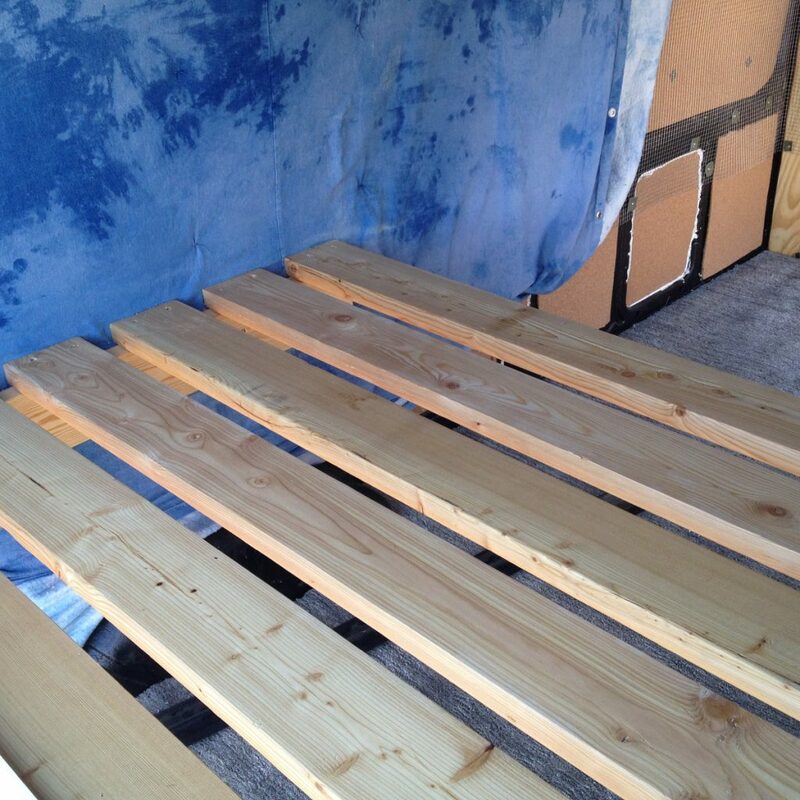 In the end the bed went widthwise across the back of the van. The two deciding factors were these. First, although I loved the raised bed idea, I would need to have some storage space no matter what, and if it didn’t go under the bed, it would still take up the same amount of space plus having a bed somewhere else. That is just wasting my limited space. Second, I am short. Short enough to fit widthwise and still have a few inches leftover. Putting the bed widthwise allows me much more open space in the living area than if it were lengthwise along a side of the wall, and since the bed can double as a seating area, I really don’t need couch-style seating. 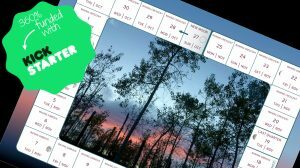 I also like that it is always set up and I don’t have to assemble or disassemble anything twice a day. 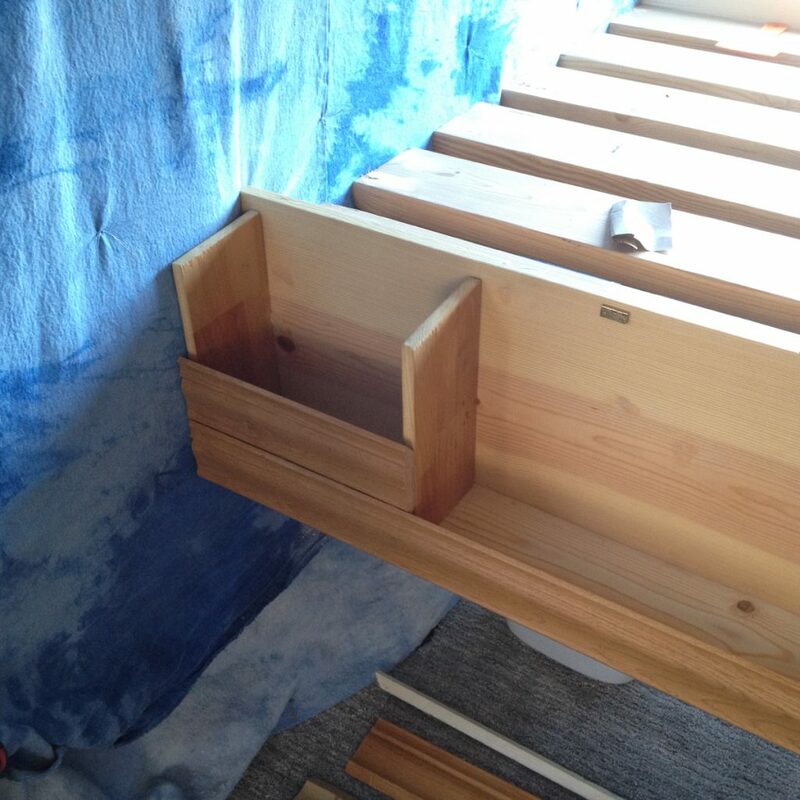 I had planned on a far more complicated structure for the bed, with built-in cabinets for under-bed storage, but as time grew short, I needed something easy. This is what happened. 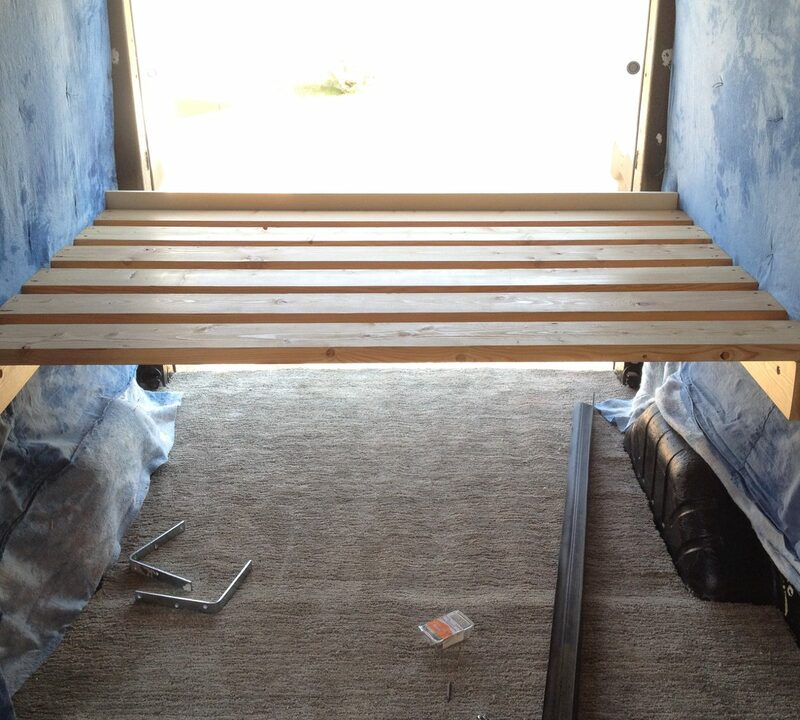 It is built entirely of 2×6 boards, one on each wall of the van as supports, and six spanning the gap between them. The space underneath is my storage area, and though it doesn’t have cabinets or drawers built-in, that actually proved an advantage. Where I thought I wanted to put things got rearranged several times since, as I found I needed better access to this instead of that, and much of that wouldn’t have been possible with the restrictions of fixed-sized spaces. 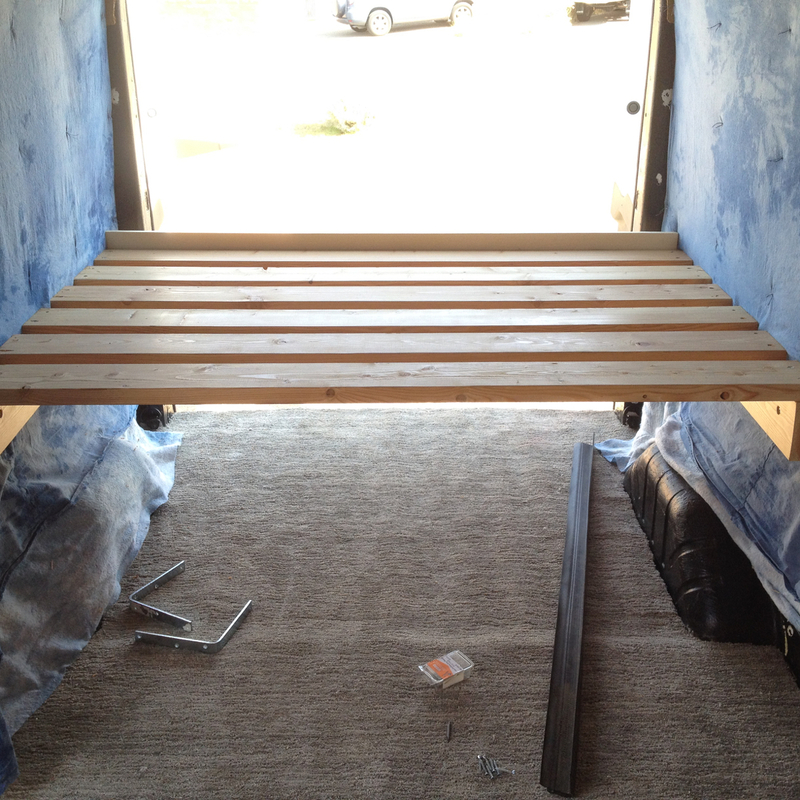 The board sticking up at the back is to keep my mattress from sliding around as I drive. The bookshelf unit will stick up on the front side to serve the same purpose. 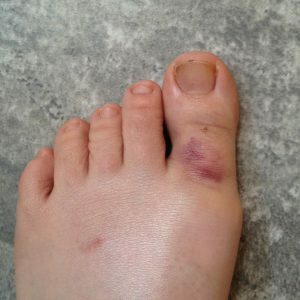 Only the latest of many sudden encounters with blunt objects. A 2×6 fell on it. This is the bookshelf, with a smaller storage unit on either side to serve as a nightstand or other handy storage. The tiny brass hinge will attach to a lid. This lid. It is a strip of moulding I had lying around, and protects the tops of my books from getting scraped by my legs every time I get in or out of the bed. It flips up on the hinges to allow easy access to the books. The white bucket is just trash and the metal bucket is my bathroom. I was checking to make sure I could easily get it in and out from under the bookshelf. Getting closer! After months of hard work, it is finally starting to look nice. And strangely, most of the work I have done, I am now covering up, which is actually what makes it look good. Now I can finally finish the pantry and partition.